Blue booze themed 1-inch button badge. 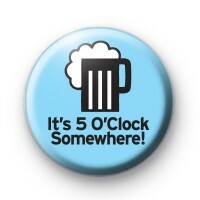 This badge has the text It's 5o' clock somewhere! It is an attitude we like & something we say a lot. This alcohol themed badge is great for Hen & Stag Party badges and helps get the drinks flowing. You just need to remind everyone that its never too early to get the drinks in because it is 5o' clock somewhere.